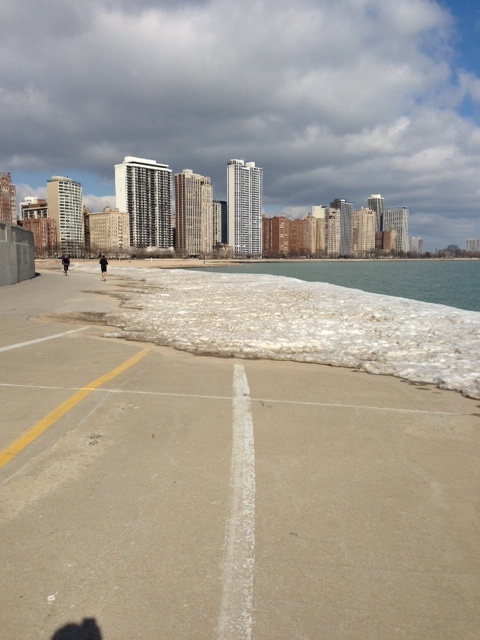 This weekend was an early indication that marathon season is approaching here in Chicago. I’m not sure if it was the slight temperature increase (hello 39 degrees!) the sunshine, or the fact that it’s nearly April, a month where many, myself included, have to put feet to pavement for races. Whatever the case, there was legitimate activity this weekend on the lake path. I have a feeling it won’t be long until the path is filled with packs of running teams, tandem bike-riding tourists and stretchy band speedo guy. Yes, he does exist. This will be my 4th year running a half marathon in April. In past years, I did the majority of my training on a treadmill. This time around I’ve been fortunate to get nearly all of my runs in outside. In doing so I’ve realized how much more enjoyable running in the city can be. Yes, even in the winter. Anytime I have to do anything over 5 miles, I typically head towards the lake. 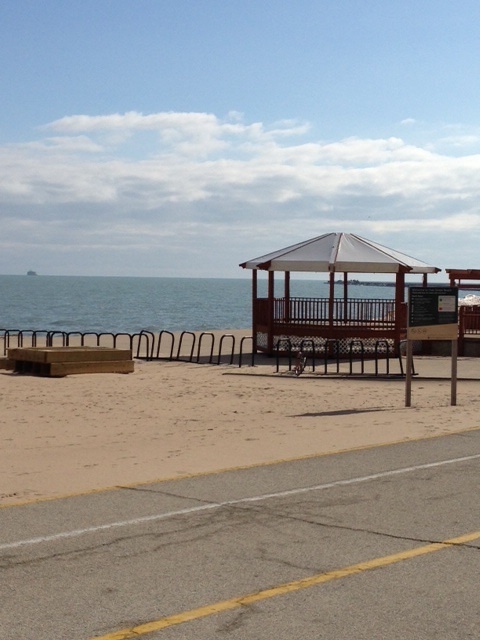 My 3-4 mile route is fine for mid-week runs but doesn’t provide as much motivation as the lake path. That, and my neighborhood route smells like food which makes me hungry. 4 miles hungry is ok. Anything above that is dangerous. Plus, once you’re on the path you can cover a lot of distance without stopping. I had to do 9 this weekend, so I figured I’d head over to the lake and see how many I could get in before I got too cold. And then I started to sweat. And I cursed myself for not taking the sun into account as I put my running gear on that morning. After all, I should know better. Growing up, my dad was the go-to gear guy. He carried rolls of athletic tape in his golf bag and believed in its superiority over nearly everything but electric tape. I was the lucky girl who got her Copas mink-oiled after rainy soccer games. And it was not unusual to find the two of us browsing the local sporting goods store each time I signed up for a new sport. Having the proper gear can literally make or break a run. And I layered a little too much this weekend. So in the spirit of do as I say not as I did, I’ve put together a list of the items I think are essential for a successful cold-weather run. I’m afraid you’re on your own when it comes to the lung capacity and leg strength. Just watch out for that March sun. Reflective running vest-I got this for christmas and I love it. Perfect for keeping your core warm but arms cool and the reflective pieces are safer than the dark knight runner look I was apparently going for when I purchased these items. Lululemon tech long sleeve-I tried to avoid the Lulu trend but they make really nice stuff. This one is great because it has thumb holes and is thin enough to layer under a half-zip for those really cold days. GPS watch-you could easily use the Map My Run app as well but I swore by my garmin watch when I was learning to pace myself early on. YurBuds-these headphones stay put and have good sound quality. I have the pair with the microphone too just in case someone calls when your phone is in the back pocket of your running tights and you can’t seem to get it out without falling over. Gum-I like to blow bubbles when I run. But it also helps keep me from getting cotton mouth and gives you something else to focus on. 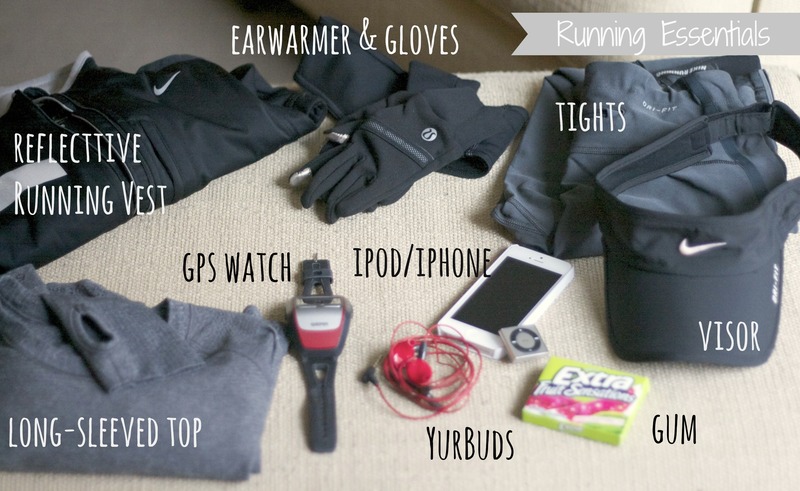 Ear warmer/Running gloves-I recommend light fabric for both of these. Plus, the itouch gloves come in handy if you plan on using your phone at all. iPhone/iPod-I used to strictly run with my iPod and I still do in actual races. I try to bring my phone if I run in the evening or a long distance by myself for safety purposes. And I may or may not love the ability to snap photos of random things I see along the way. Sue me. FitRadio-Where have you been my whole life FitRadio? Download the app and thank me later. Visor-guess who chose her ear warmer instead of her visor for a cold but SUNNY run on Saturday. This girl. I highly recommend wearing one anytime you are going to be in the sun for a long period of time. I use the crap out of mine. Running tights-Nike makes a great version. The newest of which has zippers on the side of the ankles instead of the back. My ankles thank you, Nike. Once you’ve got the gear you are ready to run all day. Or at least for a few hours before something starts to chafe, bleed or ache. Sometimes I wonder if I would run as much if I didn’t live in the city. Don’t get me wrong I’m a big fan of the new trail they put in down by my parents house, but one can only handle the excitement of smashed mystery berries and a zig-zagging chipmunk so much. And when I say excitement I mean it. Those chipmunks scare the crap out of me every time. I do enjoy a good country run every now and then though. Living in the city you get used to dodging tourists, delivery trucks and cyclists, but wildlife? Not really. Unless you count rats the size of opossums. That’ll motivate anyone to run. 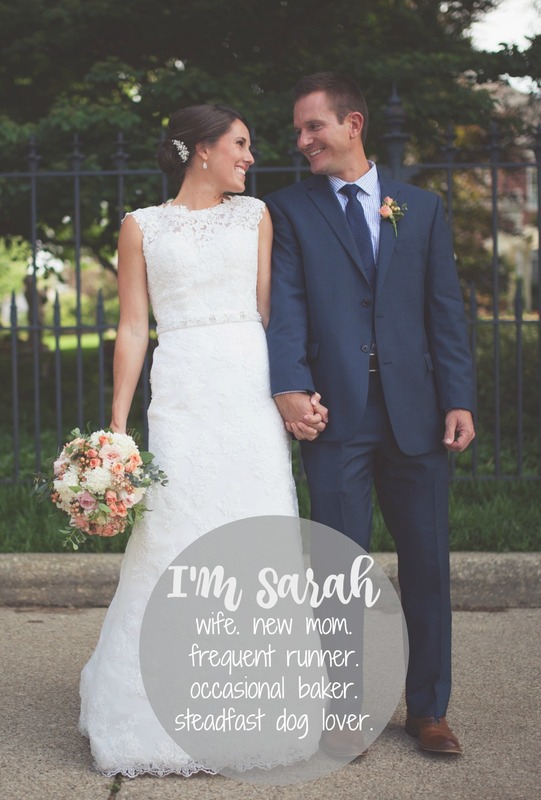 So the next time you’re visiting somewhere new, pack your running shoes. As long as you have the right gear, running is a great way to explore. You never know what you’ll run into. 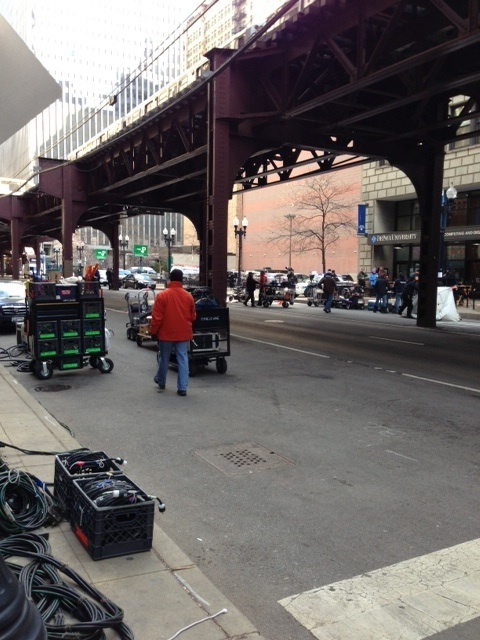 Perhaps the filming of popular TV show Chicago Fire early Saturday morning in the loop?